Country music and books. Pretty much a perfect kind of week for me when I get both on the same day in my favorite town – NashVegas. Last week I was in Nashville for the third All For The Hall concert. It’s a fundraiser for the Country Music Hall of Fame and Museum. 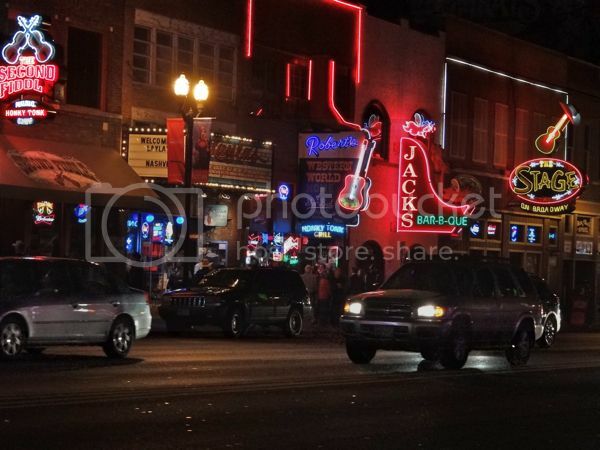 Two Nashville guitar gods – Keith Urban and Vince Gill – began the series of concerts, pulling in the best of country music both old and new to make a lot of music and raise a lot of money for the repository of country music history. I was there for the first two and plan to be at every one, front row, until they decide to stop. But first let’s talk books. 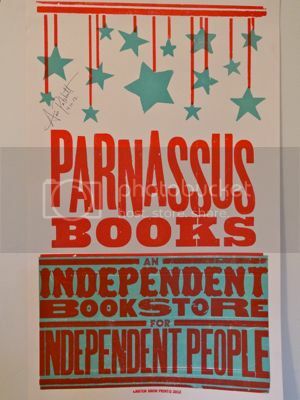 Recently Nashville upped the independent bookstore ante when Parnassus Books opened on Hillsboro Pike. Author Ann Patchett and veteran of the publishing world, Karen Hayes, decided to buck the decline of independent bookstores by opening one of their own after Borders went under and a town of that size was left with only one national chain store and some used book places. So of course I had to do my part to support their endeavor by spending a small fortune. I got lucky on that trip, though. I showed up on the day they inaugurated a conversation series with local luminaries talking about books they love. The place was packed to the gills with people there to talk about the written word and hear what the mayor of Nashville, Karl Dean, had been reading. I love the written word. I love reading it and I love writing it. I want to smell the binding and the pages. I want to scribble my comments in the margins to create a dialogue with the author. With a book I commune with the past and contemplate the future. At the store I was surrounded by so many great books I needed to read. Over here the recommended new fiction. Over there tables of non-fiction I hadn’t read. A special display for poetry. If I had won the half-billion dollar lottery prize the previous week I could have used a wagon to haul all my book purchases to the car. Since I didn’t and I still had a stack of books at home waiting to be read, I but the brakes on and bought only two: an essay collection I knew nothing about but loved the title, When I Was a Child I Read Books by Marilynne Robinson, and a novel that got great reviews, The Song of Achilles by first-time author Madeline Miller. Patchett herself walked in as I was paying for my purchases. She stood behind a table stacked with books, giving recommendations in abundance to customers seeking her guidance. If I had not already been so drunk on books I would have done something profound like demonstrate insights I had gained after reading her new memoir-ette, the Kindle Single The Getaway Car: A Practical Memoir About Writing And Life. When she wrote, “I’ve come to realize that I write the book I want to read, the one I can’t find anywhere” I nodded in agreement because I, too, am writing to create the small stories I don’t see very often. I should have told her that when she talked about a willingness to be bored at the computer instead of giving in to distractions, it was a kick in the pants I needed to persevere because too often if I’m bored while writing I take it as a sign to give up. The point, she declares, is that you keep writing until you’re past boredom. Oh no, it didn’t occur to me to talk to her, writer to writer. In that room, surrounded by a couple thousand linear feet of books all I could do was tell her how much I loved her store and how much I enjoyed the afternoon listening to her mayor talk about fascinating books I hadn’t yet read (but I have the list and will add them to my TBR pile). I congratulated her on stepping in to the literary void and taking the chance on the dying animal, an independent bookstore. I told her I’d be back. And then instead of doing the logical thing of grabbing the nearest copy of Bel Canto and asking her to sign it, I did a very Nashvillean thing. 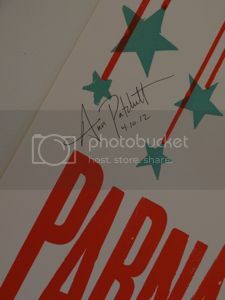 I grabbed the Parnassus Hatch Show Print I had just bought to add to my collection and stuck it out for her signature. What? You don’t know Hatch Show Print? It’s a Nashville – and American – institution that puts words on paper the same way Gutenberg did with the first press. Instead of talking about writing, we had a serious discussion of where to put her autograph so as not to destroy the symmetry and art of the poster. She also added the date. As I walked back to my car I realized I had blown the chance to start a conversation that would give Patchett an opening to say something immensely wise that was original and directed specifically at me, writer to writer. I had been so in a trance from breathing in the aroma of the pages and leather bindings and dreaming of finding my name on a similar spine facing outward to a reader one day that I had come away only with a bag of more books I don’t have time to read and her clear signature in the white margins of my Hatch print. Sometimes when I’ve gotten all fangurl and wanted to talk to a singer after a performance or stand in line for an autograph at a book signing or wait to talk to some other notable person, I’ve had some people say (usually while waiting impatiently for me), “Why bother? They don’t care. They’re not going to remember you.” But I know that I myself don’t get tired of hearing someone say they appreciated something I put my heart and soul into, whether an apple pie or a piece of writing. And I harbor a desire to connect, even for a moment, with those that inspire me to pursue my own interests. An art like writing is almost completely about reaching out to make a connection. Yes, I may have been forgotten by Patchett before I left the parking lot, but it was a perfect and perfectly energizing moment. It engaged my passion. That’s never a wasted moment. Nelson Mandela said, “There is no passion to be found playing small - in settling for a life that is less than the one you are capable of living.” No, nothing penetrating or heart-stirring happened in an afternoon at a bookstore in Nashville. However, it’s often those small and random encounters with what drives you that can encourage movement onward to something bigger instead of sitting still. I came home from Nashville and set to writing again. Even if I temporarily bore myself. I want to be on the bookshelf of Patchett’s store and talk with her engaged Nashvilleans. And perhaps have another chance at a conversation, writer to writer, that I missed. Do you have a favorite bookstore? What makes it so special? Have you had an inspiring encounter with a place or person that spurred you in your passions? Or did you have an opportunity and blow it? Inspire us all with your story in the comments box. Come back on Wednesday and we’ll talk Nashville and music. This is my favorite post of yours, Julie. I was right there with you in that bookstore. And getting to meet Ann Patchett? So cool! I don't know what I would have said to her but it would have been great to have the chance. I, too, like to connect with those that inspire me or challenge me in some positive way and let them know as much. I just wish those kinds of scenarios lent themselves to sitting down over a cup of coffee and having a prolonged conversation. Unrealistic, I know. But a girl can wish, right? How cool! Sounds like a great time. I've been tongue-tied more than once. When I finally met Julia Cameron, whose work set me on the writing path, all I could do was stutter and thank her for signing my copy of The Artist's Way. In my new hometown, there are several indie bookstores. One of them in particular is going to be major trouble for me, I can tell. I loaded up with books with local flavor and had to remind myself that I live here now, so I can come back anytime. I don't have to buy out the store! Buying out the store. I can relate to that. I grew up spending all my time in libraries. Now I have to start reminding myself that I don't have to own every book I want to read. There is something called "interlibrary loan." And Tami, it's always possible to be able to sit down and chat, but not if you don't step up and say hello to begin with. You never know where that hello might lead you. Julie, great post. I also love bookstores more than any other shopping places. Amazon browsing can’t even compare. Last year, when I visited Toronto for a few days, I dedicated one day to walking around downtown from one bookstore to another. There were at least a dozen, and each one had its own personality. And in every one of them, I found a book or two that I liked, held them in my hands, and felt happy. Oh, Olga. I loved that story. Surely no lover of books who could no longer read them could resent a young book lover from taking over guardianship of them. I sometimes wonder what will happen to mine. I know my children will never read them. I am jealous, sounds like you had a fabulous time. I'm with Tami, a seriously great read. Aside from all that great music, the books, and Ann too, how did you ever come back down to the ground. Lovely. I wonder if we are ever in our skin when he happen upon our writing mentors. I love this post, Julie - great storytelling and sharing the experience with us! I can totally relate to your fangurl moment... Mystery novelist John Straley lives here in Sitka, and I love his writing. When I had the opportunity to talk to him a few years ago, I found myself totally writer-struck, chattering about whales (his wife is a renowned marine mammal biologist) instead of thanking him for sharing his words. Couldn't believe what I was hearing myself babble on about! I love your comment, Brenda: "I wonder if we are ever in our skin when we happen upon our writing mentors." Beautiful. Funny, one of the books I read while we were out at sea last week was Ann Patchett's "Truth and Beauty." Whew... Beyond the powerful reflection on friendship, thought it was fascinating to hear the story of a writer's career beginning. And for my favorite bookstore... gotta be Powell's Books in Portland, OR. Lucky me that I have a family who thinks it's perfectly reasonable to plan a weekend getaway in Portland JUST to visit Powell's. What a delightful read. Thanks for the trip to Nashville! Thanks for the reminder about Ann P.s The Getaway Car. Read it yesterday - LOVED IT. Perfect timing for me.